And the rich get richer. In this case it’s both Netflix and Jerry Seinfeld. 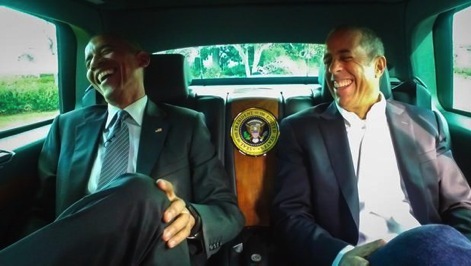 The king of all streaming networks and the swimming-in-money comedian have signed a deal that will take Seinfeld’s Comedians In Cars Getting Coffee away from Crackle, where it originated in July 2012. Seinfeld also will star in two new standup specials for Netflix, which says that new episodes of Comedians In Cars -- 24 in all -- will debut in late 2017 in addition to earlier editions of the java-fueled get-togethers. But no, Jon Hamm will not be the official tour guide. ***On the Everything Old is New Again front, NBC says that Will & Grace will return for a limited 10-episode run sometime during the 2017-18 TV season. The four principal cast members -- Eric McCormack, Debra Messing, Megan Mullally and Sean Hayes -- all will reprise their original roles. It originally aired from 1998 to 2006 on NBC and won 16 Emmy awards during that time. NBC also has announced a two-season pickup of its breakout hit, This Is Us, with a minimum of 18 episodes per season. And the Peacock has ordered 20 additional episodes of The Wall, a big-money game show produced by big-moneyed LeBron James.